It's never a good idea to just dump an animal into your aquarium. This can shock it and introduce disease into your tank. However, you can mitigate these risks by following careful technique. Despite the fact that crabs and frogs are very different animals, the best procedure for introducing them into an aquarium is identical. Research your species before purchasing them to make sure they will work in your tank. Many pet shops sell “freshwater” crabs that actually come from brackish water -- water with some salt in it, but not as much as seawater. Additionally, frogs and crabs should not be kept in the same aquarium, though the procedure for introducing them is the same. Select your species based on your research and your aquarium. If you have a freshwater tank, make sure you have a freshwater crab. Make sure you get the frog you think you are getting. Both the African dwarf frog and the African clawed frog are sometimes sold as “African frogs” or “aquarium frogs,” though the clawed frog is much larger and more predatory. Perform a water change before introducing new animals to the aquarium. A 25 percent water change should be sufficient. Make sure you dechlorinate the new water and that the temperature is roughly the same as the old water. Float your bag for 10 minutes. This is to make sure the water in the bag is the same temperature as the aquarium water. Ensure the bag is sealed. Dump the water and your frog or crab into a large, clean and unsoaped container. Buckets and large food safe plastic containers work well. Add 1/2 cup aquarium water into the bucket or container from Step 5 every five minutes. Your goal is to get a 4:1 ratio of aquarium water to bag water. This should take about half an hour. Alternately, you can use a length of air line tubing to slowly drip water into the bucket. Net the frog or crab to introduce him into the aquarium. Do not dump the water from his bag or the bucket into the aquarium. Discard the water from the bag. It is probably rich in ammonia and can contain parasites. Top off your fish tank with fresh, dechlorinated water of about the same temperature as the tank water. Avoid feeding your new pet for at least a day. He will not eat from the stress, so the food will just decay and pollute the water.  Use some kind of lid to keep critters from jumping.  Do your homework on your species' compatibilities. ⚠ Keep an eye on any kind of drip system, otherwise a flood could result. 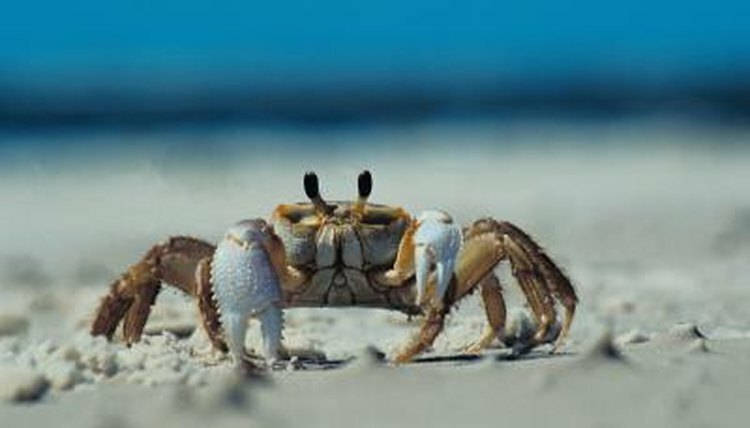 ⚠ Crabs like to sneak away during this process -- watch them. ⚠ Soap is toxic to many aquarium critters, so wash your hands with soap only when you're totally done working with your aquarium.